Drawing Marathon Alum, Tricia Sellmer, shares studio practice. Sellmer is a multi-layered, multi-media Canadian artist working primarily within the parameters of painting and drawing. 1. Describe a typical day in the studio. My days start with coffee, reading and a couple rounds of Sudoko. I have two studios in my home, the Glass Room and the Painting Studio. If I plan to work in the Painting Studio I begin around 9:30. As soon as I slide the door shut I select music for the day, check out what I had been working on then begin to draw, scrap, drag, layer, smear and drip oil pigments across canvases. If I am in the midst of a series I carry on from where I left off the previous day and will work to midday, take a break, pick up messages, have something to eat, send out e-mails, possibly go for a walk and then go back to work for a few more hours which takes me into the early evening. I then go into the main part of my home, change out of my painting clothes, pour myself a glass of wine, begin to prepare dinner or follow through with evening arrangements. If I stay home, I watch a couple of news channels and then will likely work in the Glass Room for a few more hours. If my day is to be spent in the Glass Room, which is used for research, drawing, correspondence and walking on the treadmill, I follow the same routine, except that I usually do not play music. 2. Walk me through your process. What are some of the parameters or problems you set up for yourself within your work? I set different parameters for each series or project. For example, for 99Ways to see a Dying Rose, in one part of the series, I used only 11” x 8 ½” vellum, the small stem of a rose as a drawing tool and a jar of black ink that I had prepared strictly for this project in which I added a few drops of water to the ink. I told myself that I would only use one continuous contour line, use only the ink prepared for this project (I would never make up a new batch), and that the small stem of the rose would only be dipped into the ink once for each drawing. Never twice. Once the stem ran out of ink for that particular drawing, the drawing was placed aside, and then I took the next sheet of vellum from the stack that was on the table beside me. I then rotated the rose that I was drawing to a new angle, dipped the stem in the ink and drew another rose using the continuous contour line. And so on. I drew like this, turning the rose around and round, finding a new image for each drawing, with the same stem as the drawing tool, using the same ink that was prepared only once, for five days straight until the stem could no longer hold ink. Then I was finished. In the end I had a stack of contour drawings completed on vellum an inch and half thick. Plus I had about half an inch of vellum left over, an empty ink pot and bit of a stem that could not take another trace of ink. I was finished with the drawings but I needed to take the next step. I instilled more parameters. I took each sheet and layered it with two more drawings which were placed on top of each other to create a new image. So in the end, the image was three layers of vellum. These layers can be changed to make different final images. The new three layered image is then shown in a grid format mounted as close together as possible with other three layered images held in place with quilting pins along the outer edge, bent to hold the work on the wall. The final parameter I set up for 99 Ways to See A Dying Rose is that I did not pierce the skin of the vellum. This was important to me. The work has been shown a number of times: New York, Berlin and Kamloops. As another example with the piece, You Brought Me the Moon But You Did Not Stay I listened only to Kiri Te Kanawa’s 50th Birthday Concert recording, eight to twelve hours each day for ten days straight. Nothing else. And this CD, (yes a CD) was played on a Walkman I had used during a 2004 art residency while in Italy. It was important for me to choose this particular Walkman even though I had three others. I also knew before I started You Brought Me the Moon But You Did Not Stay that the paintings would consist of twelve 30” x 36” canvases, mounted in a grid formation, mounted side by side, to create a whole. The work was titled after I was finished. But for the collaborative project boppin’ with Mr. Mynah, with Alexander Forbes, the title was already chosen and the parameters that I set for myself included nine, 48” x 48” upstretched linen panels with five brass grommets along the top and five along the bottom of each panel. I decided that the only music I would listen to was Guy Davis’ Skunkmello. A final example of parameters that I could set up before applying paint to canvas includes my most recent painting series And the Shadows Follow Me. 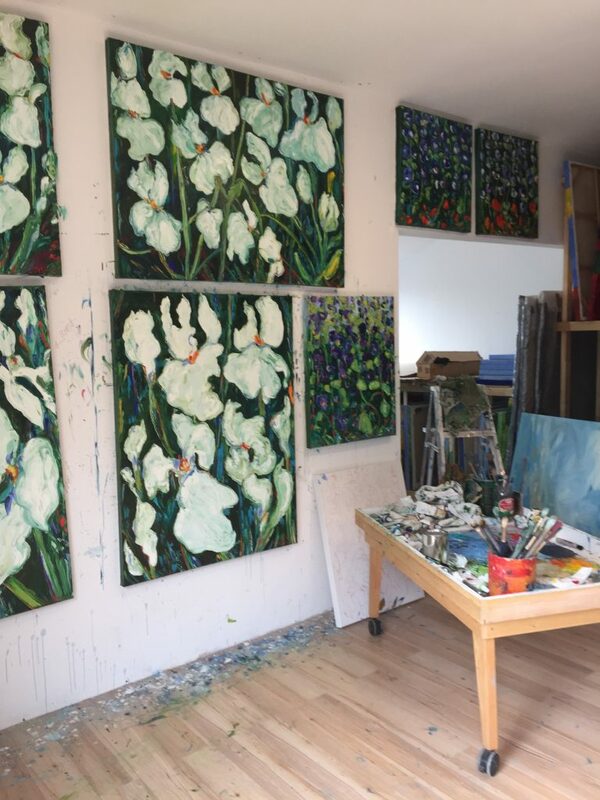 I knew the irises were to be disjointed with only the slightest hints of colour coming through the titanium white petals, and that all the painting surfaces were to be only on 48” x 36”canvases. However from the beginning I did not know how many canvases or panels I would need to explore the images that were percolating in my brain. For the music, I allowed a wide selection of recordings from Mozart and Beethoven to the film score from The Secret Garden as well as recordings by both Kris Kristofferson and Bruce Springsteen. When I finished the eighth painting it was only then that I knew the series was completed. So in essence the parameters in the four series had some similarities but also had some distinct differences. 3. What do you keep in the studio for inspiration? My studio is my home. I am surrounded by family photographs, artifacts from travels, art work from fellow artists, books, music and my journals, both electronic and hand written, and my work that covers the walls, some of which dates back to the 1990s right through to this year. One working studio space within my home is the Glass Room which is a long room with glass windows on three sides. The Glass Room sits facing over the valley. From this studio I am surrounded by the amazing landscape in which the sky meets the undulating hills and two lakes. This particular landscape is another source of inspiration. Generally, if I play music in the Glass Room, which is not often, it is classical music, another form of inspiration. 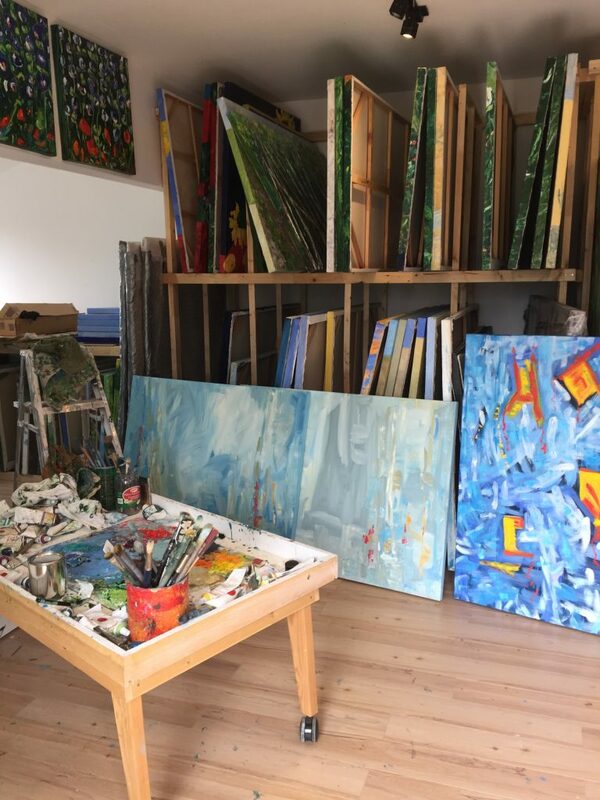 My Painting Studio on the other hand, which is thirty-nine steps away from the Glass Room, contains piles of music recorded on CDs, boxes of oil paint and stacks of blank canvases grouped according to size. The music, oil paints and blank canvases become my inspiration when I enter the Painting Studio and slide the door shut. I am totally alone in my own world, consumed by the sweet smell of fresh oil paint, the strains of music and the natural light filtering through the glass door. When I pick up the conte’ crayon to quickly draw out a quick, twenty to forty second, continuous contour line that has formed and flowed from the music translated in my brain, this line too becomes an inspiration to begin my images. 4. Do you listen to anything while you work? Yes, I listen to music while I am in the Painting Studio. I select different pieces of music as soon as I enter the studio. I never deviated from this routine. The selection varies from classical to jazz, from pop to folk, from the blues to country and everything in between. I do not listen to electronic music or the spoken word. What becomes important to me in listening to music is that I will find the rhythm and the length of the beat that translates into the length of brush or pallet knife stroke for each series or project. At the moment I am listening to the music from two film scores, Midnight in the Garden of Good and Evil and One Fine Day, plus recordings by Nina Simone and the 20th anniversary Discdrive, complied by Jurgen Gothe for CBC. 5. How did studying at the New York Studio School influence your current studio practice? 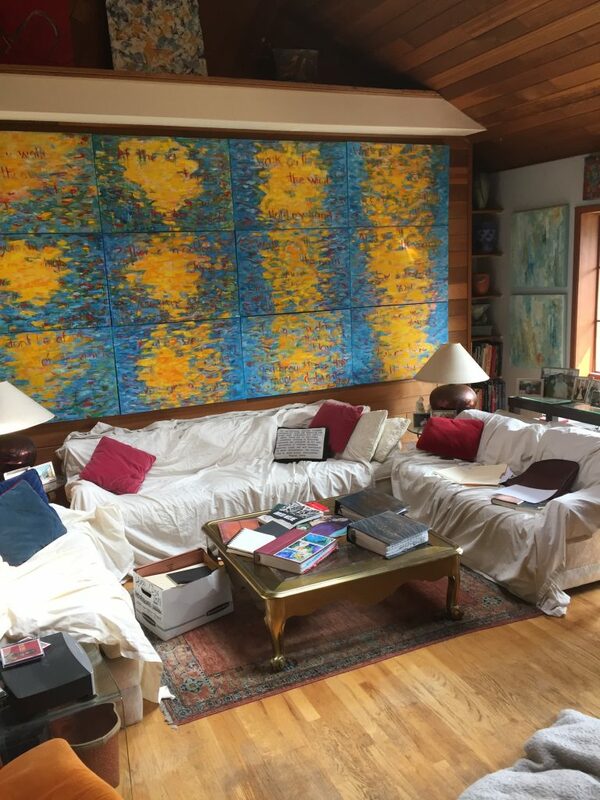 One of the most crucial influences that I took away from the New York Studio School is searching for the nugget, the kernel of visual literacy and translation that delivers a powerful image within my paintings. The time spent in the school’s evening critiques fused the day’s work painting and drawing, which pushed me to further explore my use of colour, form and drawing, thus delving deeper into the painted canvases rather than leaving the images as illustrative, unresponsive and sometimes flat. I believe the experience at the New York Studio School gave me permission to work outside some of the boundaries that I had previously held from other art schools. 6. Are there any upcoming shows or projects on the horizon you would like to share? And where can people see your work in person and / or digitally? My work can be viewed at www.triciasellmer.com . Since 2012, most of my work was exhibited through Chazou Contemporary Art Gallery but it closed June 2nd, 2016. At the moment, in between smaller projects, I am working on a large, complex and complicated work that involves visual imagery, the written word and the need to write/right a wrong titled Walk into the Wind. I hope to complete the visual imagery next year and the written word in book form within a three year time frame. The selection of galleries to exhibit this work is still to be confirmed.